I’m a one man shop focused on CNC routing and design, with some other useful capabilities, primarily serving the Twin Cities of Minneapolis and Saint Paul, but I can certainly ship anywhere. 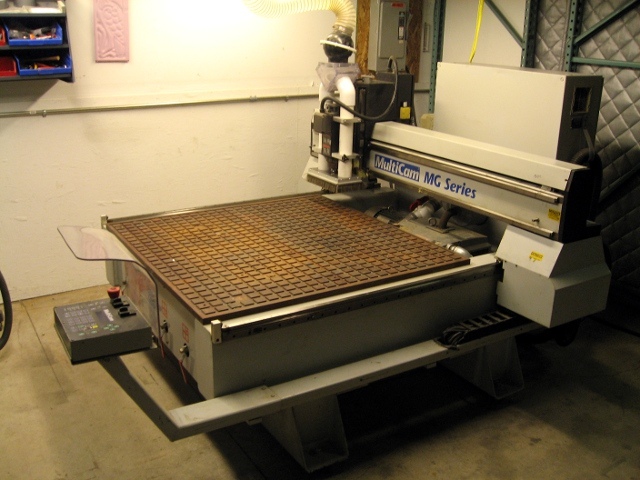 On the hardware side of things, the star of the show is my trusty Multicam MG series CNC router. It’s small, but heavy and fairly fast, being equipped with servo motors. Current spindle is 5HP, large enough to cut wood, metal, and aluminum quickly. In addition I have a vintage manual Bridgeport milling machine, and also a cold saw which cuts aluminum and steel quickly, cleanly, and accurately. On the software side of things, I have Vectric’s VCarve Pro, which can turn most any DXF or EPS file into code for the router. I also have Meshcam, which is 3D software that generates machine code from a 3D file, typically an STL file. I also have Solidworks. Additionally, I do design work in Inkscape and Blender 3D. If you’ve designed something in either of these programs, I can help you turn it into a physical object.